Description: Giolon: Here's another of my favorite images from artist jwebster45206. It's even better in hi-res! I have to say...I think this was the image that cemented it for me, jweb does really, *really* nice butts. I want to thank jweb again for letting me show off some of his art! Taht is an awsome pic love the depth of the colors. The detail on the buildings really come out well in the larger image, simply superb work! 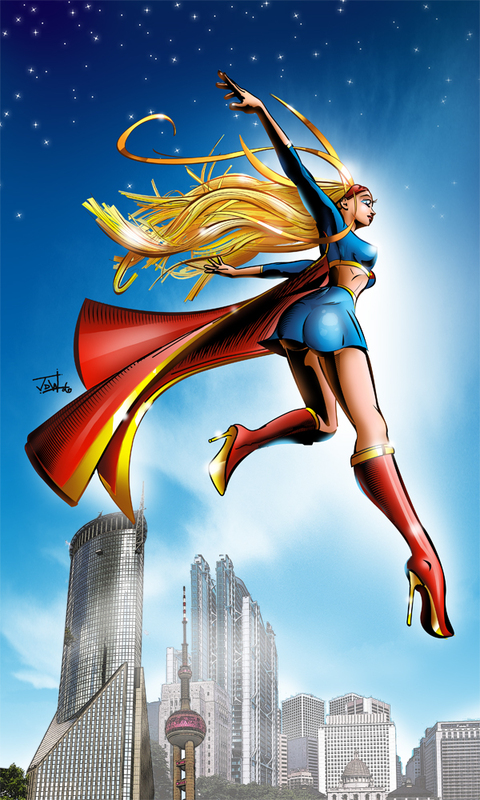 Although I am not a fan of Supergirl (or Superman for that matter), this is a brilliant piece of art. It is marvellously detailed and through the use of colour and definition, captures that comic book feel. Also, I have to agree with you, Giolon, that is a tasty looking bum she has. Aside from that, I do like the hand drawn stuff. Not much of a drawer myself so it's nice to see someone with a real talent for it. 1/5 for the landing though. Hope she trips so I can steal the boots.